Regular readers of this blog will know that I’ve hardly shied away from criticising marketing campaigns in the past. But fair’s fair – when the industry gets it right, I’ll be the first to stand up and clap. And this week, Nivea played a blinder. I’m not just clapping, I’m staging a standing ovation, meets Mexican Wave. For as a mom with pale Caucasian skin, to a daughter with an equally fair complexion, I have to engage in a daily sheep dip-style ritual with an incredibly wriggly two-year-old and a bottle of factor 50. It doesn’t usually end well. 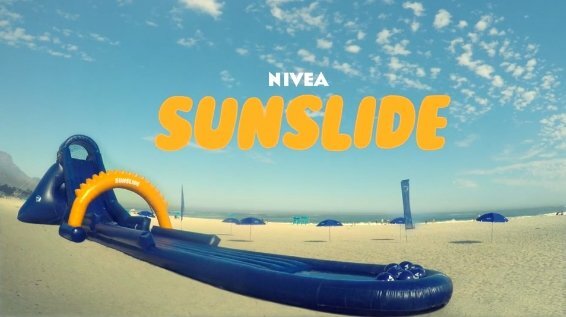 So imagine my elation when I discovered that Nivea (in conjunction with FCB Cape Town) had installed a waterslide that applies sun cream to kids as they whizz down. I’m only disappointed that the SunSlide, as this sun-safety-meets-funpark installation is known, is all the way over in Cape Town, and apparently a one-off. Take it from me Nivea, this one needs to go global. Or preferably, if you could invent a mini version that would fit in a London Victorian terrace, I have a backyard ready and waiting. Next to this, the week’s other big marketing news paled (‘scuse the pun) in comparison. And although I am too busy grabbling with the afore-mentioned toddler to take glamorous selfies and post them on Snapchat, I shouldn’t hold that against L’Oréal, who became the first beauty company to launch a Snapchat lens ad at the weekend. Indeed, L’Oréal has been held up as an example of a brand that gets it right on social media, and if Facebook’s recent Beauty Summit is anything to go by, you should start taking notes. I have no difficulty believing that smartphones are the future of e-commerce, as Facebook claims, for even luddites like me are beholden to our pocket devices. Facebook implored brands to build brand equity with smart, savvy video campaigns that will engage social media users within the first three seconds – because, apparently that’s all the time they have to drive their point home. I think, when we look back, 2016 will be the year that beauty finally got on board with online. From a place when most could barely cobble together a website, beauty brands have stepped up and are now becoming leaders in the field. And yes, this sparkly technology is all very well and good but sometimes, all it takes is a slide. Or a metaphorical slide. For can we really attribute the success of L’Oréal’s Root Touch Up campaign to expert manipulation of the social media playing field, or is it simply the case that the product was inspired? Need + solution = success. Brands would do well to remember that too.